Miguel Rosales, designer of the bridge, met Wednesday with students from Greater Lawrence Technical School. For many who live north of ­Boston, the Zakim Bridge completes their route along Interstate 93 into the city. But for three high school students from Greater Lawrence Technical School, the bridge leads all the way to Kansas City. The students – Berioska Cardenas and Tommy Espinal, both 17, and Yordy Collado, 16 – are headed next month to Missouri for the annual Skills USA finals after winning a gold medal in the statewide vocational competition in Marlborough. They earned the honor last month for their 8-foot scale model of the Zakim Bridge, designed and built in their metal fabrication class. Their model not only won them ­acclaim, it also got them a tour of the real structure given by the man who helped build it, the designer Miguel Rosales, the lead architect on the 10-year-old bridge. 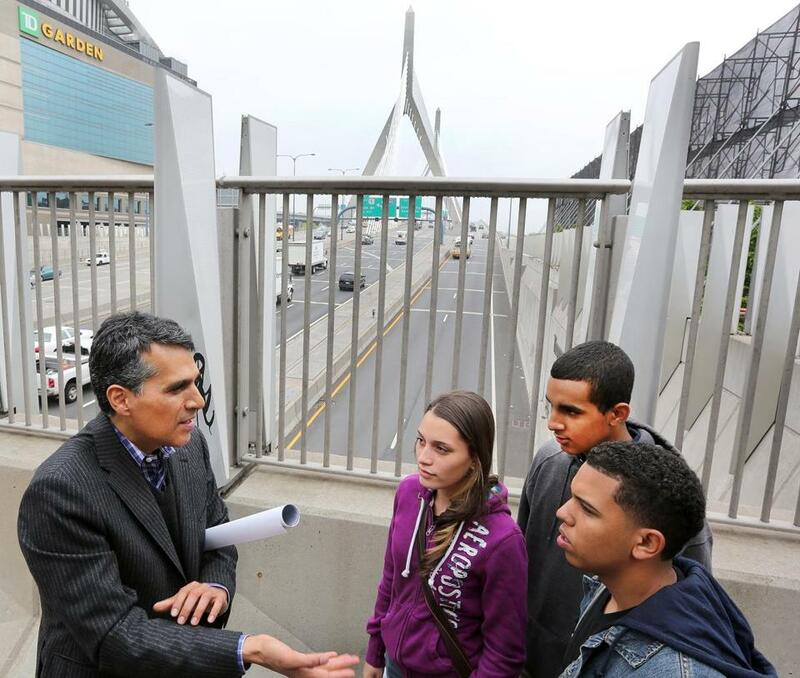 Meeting the students and their ­advisers recently in the tiny, grassy park next to the TD Garden that overlooks the distinctive, cable-stayed Leonard P. Zakim ­Bunker Hill Memorial Bridge, Rosales said he intended to ­design a symbol of the new ­Boston. Carrying a leather backpack over his shoulder, the dapper designer led the wide-eyed students down past the North End’s Lovejoy Wharf, where a construction crew is tearing down a dilapidated building near I-93. They walked along the Charles River locks until they were standing near the water’s edge below the Zakim Bridge, named for the late civil rights activist Leonard Zakim. Over the din of traffic, ­Rosales patiently explained the bridge’s design concepts: its cantilevered northbound lanes, its use of open space to make it appear lighter, and its ornamental towers intended as a homage to the nearby Bunker Hill Monument. With about 1,400 students, Greater Lawrence Tech attracts students from Methuen, ­Andover, and North Andover, but the majority, including all three of the model builders, come from Lawrence. The school’s preponderance of ­Latino students made the meeting with Rosales, which was suggested and coordinated by an administrator, particularly special, said Kathie Howe, the school’s director of community services. “It’s wonderful to have a role model,” she said. The students came prepared with questions scrawled on ­index cards. What inspired the architect? What type of 3D software did he use to design the bridge? And would he like to see photos of their project? “Pretty good,” said Rosales, examining pictures of their scale model and their design plans. “I think the top is a little short.” The students blushed. When one of their metal shop instructors suggested they build a scale model of the ­Zakim, the students quickly embraced the idea. Rosales, who told the students he is working on the Longfellow Bridge restoration and a new design for the rusted old Charlestown Bridge, asked whether they would use steel for the cables on their model. “I wouldn’t let anything else in my shop,” said Steve Sirois, one of their metal-working ­instructors. Rosales explained that the scale model in his office features cables made of elastic. “Much easier to work with,” he said. James Sullivan can be reached at jamesgsullivan@gmail.com. Follow him on Twitter ­@sullivanjames.